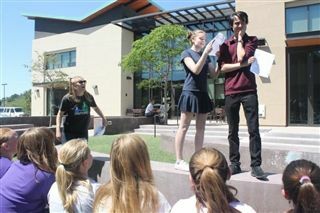 On Wednesday, April 20th, Pacific Ridge came alive with verse and rhyme as four professional Shakespearian actors roamed the campus in celebration of National Poetry Month and Shakespeare's Birthday. On Wednesday, April 20th, Pacific Ridge came alive with verse and rhyme as four professional Shakespearian actors roamed the campus in celebration of National Poetry Month and Shakespeare's Birthday. The actors popped into classrooms and offices to deliver monologues, sonnets, and hip-hop style breakdowns of the bard's poems. During lunch, students got into the Shakespearian spirit by participating in flattery and insult slam competitions using Elizabethan era vocabulary. Students delighted in stringing together barbs including, "thou art a peevish, sour-faced boar," then soothing the sting with compliments including "is thou not the most delicate, honey-tongued wafer-cake?"